Chicago, IL – Three cafeteria workers from a Chicago high school have been hospitalized, suffering an acute reaction following a hot sauce prank. A male student at Highland Park High School will face five counts of misdemeanor battery for dousing spaghetti marinara with Da Bomb-brand hot sauce during a May 14 lunch period. Authorities intend to charge the teenager as a juvenile. One student managed to taste the intolerably hot concoction before alerting school officials. But by then the three aforementioned staff members and several students had inhaled the fumes from the fiery sauce, which caused fits of coughing, wheezing, shortness of breath, and skin rashes. No serious injuries were reported, but the three employees were treated by the school nurse and taken to the hospital as a precaution. Though investigators are uncertain as to exactly which type of the Da Bomb-brand sauce was used, the Final Answer Extract, one of their popular varieties – comprised of habanero peppers, pepper extract, apricot nectar, mustard flour, garlic, allspice and spices – weighs in around 1,500,000 Scoville units. Wow. Let’s just say it is very hot. Just a note, the Trinidad Scorpion Moruga Blend, endemic to the district of Moruga in Trinidad and Tobago, is currently the world’s hottest chili pepper cultivated, and is in par with most law enforcement-grade pepper sprays, according to the Scoville scale of heat. The Scoville scale is the measurement of the pungency (spicy heat) of chili peppers. BWW Blazin’ sauce weighs in at around 300,000 Scoville units, making it about 60 times hotter than a jalapeno pepper, or about in line with some of the hottest liquefied habanero peppers available. In Scoville’s method, a measured amount of alcohol extract of the capsaicin oil of the dried pepper is produced, after which a solution of sugar and water is added incrementally until the heat profile is just barely detectable by a panel of tasters; the degree of dilution gives its measure on the Scoville scale. A sweet pepper, containing no capsaicin at all, has a Scoville rating of zero, meaning no heat is detectable. 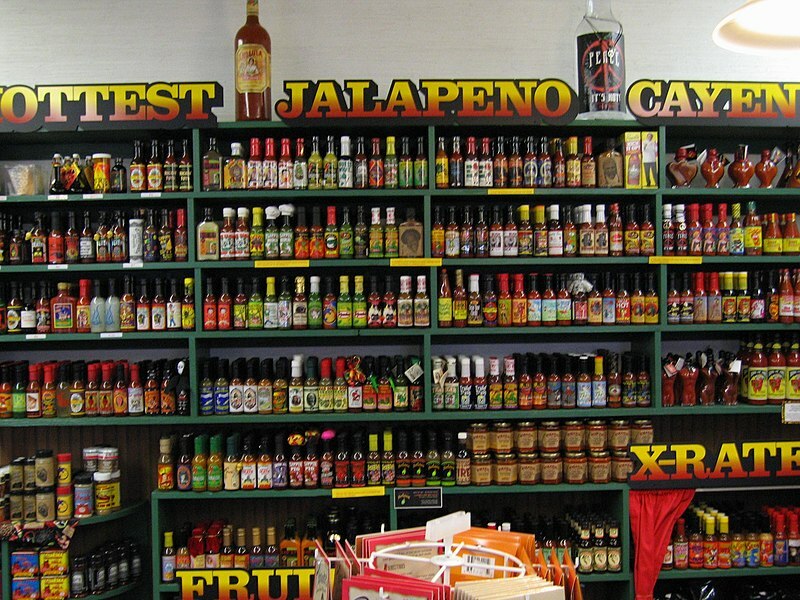 Hotter chilies, such as habaneros and nagas, rate around 200,000, indicating their extract must be diluted over 200,000 times before the capsaicin present is deemed undetectable. Here is an example of a soldier taking the Da Bomb hot sauce challenge, gulping down a generous spoonful. Warning there are bouts of blatant language intermingled with the laughter, spitting, snot, and suffering. People who are typically unaccustomed to consuming hot sauce are especially sensitive to the painful burning, runny-nose, and tear-inducing effects from capsaicin – the active element of a chili pepper. Water can actually make the burning seem worse, as condiments containing capsaicin are not water-soluble, therefore heat-enthusiasts recommend slugging down milk to ease the discomfort.